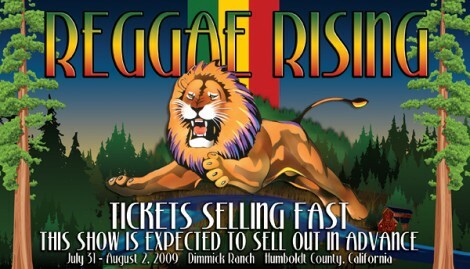 [Humboldt County, CA July 8, 2009] Tickets for this years Reggae Rising Music Festival are are selling fast and this years show is expected to sell out in advance! Dimmick Beach Camping is 100% SOLD OUT. Limited onsite premiere camping still available at Cooks Valley Campground and French’s Camp Group. Get yours now while they last!! !…Be a part of the party! To purchase tickets and camping online, or to see a list of ticket outlets, to this years festival go to: www.reggaerising.com. Last date to order tickets and have them mailed to you is July 15th at midnight. All tickets purchased after this day and time will be held at Will Call under the name purchased. Photo ID will be required to pick-up.